It's not common that you read a story where a beautiful, blonde young ingénue in 1963 New York falls for a leading man who is... pinoy. This is an honest, sincere love story of two people from two different worlds. The flow of the story is smoothly written and easy to follow. The author did a good job of describing his true life's experiences while on active duty in the US Coast Guard. 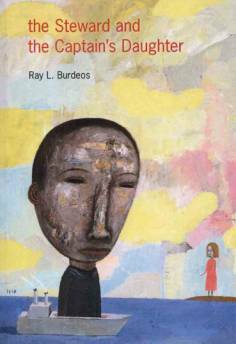 Ray Burdeos lives in Galveston. He retired from the U.S. Coast Guard in 1979, after 23 years of service, for which he received commendations and an achievement medal. After earning a Bachelor of Science degree in Healthcare Sciences from the University of Texas, he managed the Department of Defense Outpatient Clinic at St. Mary's Hospital for a time. But this story takes us back almost 50 years. Burdeos and other Filipinos were permitted to enlist in the U.S. Coast Guard and Navy, and doing so fulfilled a long-time ambition of the author. He was assigned, as were most Filipinos, in food service, and he became the steward to the captain of the Coast Guard in New York, Captain Ross P. Bullard. That was 1963, a year that changed the author's life. In the course of his duties, he met Kim Bullard, the captain's daughter, and they were attracted to one another. They began to see each other secretly, and the attraction grew to love. But this was love between people of different races, and America in 1963 was not ready for that, certainly not in the military. Kim and Ray knew they would have to confront her parents with what was already an accomplished fact, and neither wanted to hurt her parents or embarrass the military service. Capt. Bullard discovered them together one day, before they were quite ready to expose their loving relationship. The captain was angry but amazingly restrained, trying to understand how a lowly steward, and one of Filipino background at that, could ever aspire to seriously court the daughter of a Coast Guard captain. What would that do to Capt. Bullard's career, to have a Filipino son-in-law? Bullard was an excellent commander and was in line to promoted to admiral. But this is really a story about what America was like in the 1960s. It was a the time of the Vietnam War and the protests against it, the time of flower children, a time of dramatic change in the American population and its viewpoint. While a relationship between an enlisted man and a high-ranking officer's daughter would cause fewer eyebrows today, the attitude of the military and of the population as a whole was not so tolerant and benevolent in the 1960s. The captain arranged for Burdeos to be transferred to New Orleans, putting distance between him and his daughter, resulting in the eventual discontinuation of any contact between them, clearly a profound loss for each of them. Burdeos has chronicled that loss and the attitude of his friends and acquaintances in the military and out of this touching memoir, replete with photographs. It reads easily in an evening. Change is inevitable and this little volume and its story is a testimony to the ability of the human spirit to recover after being severely challenged. We don't know what happened to Kim, but Ray married and had children and grandchildren. And life goes on. But we are changed.